Maintaining physical fitness and staying active is one of the most important benefits for our health as we age. However, older adults may find some traditional workouts to be too strenuous or painful to participate in regularly. We have compiled a list of our favorite laid back and fun activities that are also excellent ways to exercise! We believe the best workout is one that doesn’t feel like “work” at all! Pets are a lot of work, and even if you don’t have one of your own, try spending an afternoon taking a friend or family member’s dog to the park. You may be surprised to find that looking after a pet for an afternoon is plenty of exercise! Many communities have therapy dogs available to play with, and there have also been many other proven benefits of spending time with animals such as boosted mood and lower stress levels. Plus, who wouldn’t want to spend the afternoon with an adorable furry friend? Pool exercises have the advantage of allowing you to perform exercises without putting excessive stress on your joints. In fact, water aerobics can even relieve arthritis and joint pain and increase bone density and muscle mass. You can try exercises such as aqua jogging, flutter kicks, standing push-ups, and even dancing! Balloon volleyball is a silly alternative to regular volleyball that removes the chance of injury and joint pain from a traditional firm volleyball. For this game, all you need is an inflated balloon and a few friends. The best way to run this activity is to assemble a group together and enjoy laughs as you attempt to prevent the balloon from hitting the ground! Here is a fun example: balloon volleyball. A little friendly competition is a fantastic way to have everyone active and motivated. You can host a walking contest among friends or in a community! Simply carry a pedometer to track progress and set goals such as “add 500 steps a day” or “walk 2 miles”. Consider making the competition even more interesting by adding prizes and trophies for “Most Steps Walked” or “Most Improved”. The weather is warming up and the flowers are blooming, so it is the ideal time to try your hand at gardening. Gardening is a wonderful way to stay active and enjoy the beautiful outdoors. Don’t be intimidated if you have never gardened before, here are some best practices for new gardeners! When it comes to group fitness classes, the options are nearly endless. Whether you want to participate in yoga, martial arts, aerobics, running, boot camp, sports, or more, there is an option for almost everyone. Group fitness classes are an excellent way to stay active and also meet new friends. Some individuals find it easier to get inspired to workout when you are among other people who are having a blast! 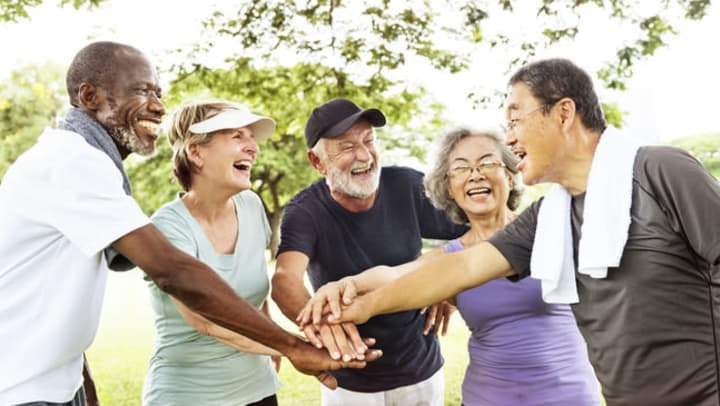 At Discovery Village we consider the physical well-being of our residents our top priority, so, we offer an extensive activities program with a variety of different adult activity and fitness classes. Take a look at our activities calendar to see all of the classes we are offering this month! We encourage you to find enjoyment in staying fit and continue to find creative ways to get out and be active. Staying mentally and physically active is crucial to your overall health and happiness, and fortunately, there are many activities that are available!